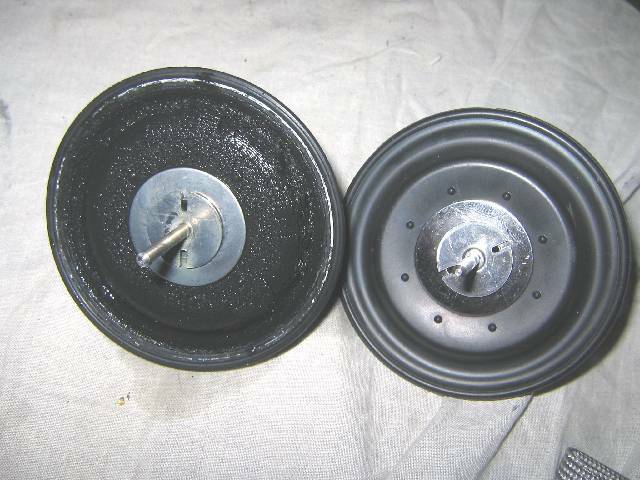 Comparison of the old and new diaphragms. It is clear to see how badly perished the existing diaphragm was and indeed it had a couple of holes in it which will have reduced the pressure differential either side of the disc resulting in a partial failure of the valve function. The shaft of the new diaphragm required lubricating with silicone grease before refitting and care should be taken to balance/centre the diaphragm on the shaft to ensure it is held centrally in the valve body.